PE Summative- What does it mean to be fit? During this unit of fitness I have learned many things. For example I learned what fitness really means and the components of it. I have also learned my levels for each component. Here I will tell you how i learn’t all of these things. On the first day of PE we all went to a wall wisher and wrote down all we thought we knew about what fitness means. He read through all of the ideas and not even one of them was precisely correct. He later then told us the definition, and it was this. ” the ability to cope in our environment”. I had always though that being fit meant to be strong and good at what you do, but it actually means to be able to meet the demands of my environment and that surprised me. But before we started doing anything physical he taught us what the components of fitness were. I will now tell you what they are and also their meanings. Cardio Vascular endurance (also known as stamina) is the ability that allows you to do sports like long distance running because your heart won’t slow down making it hard for you to breath. Muscular Endurance is the ability that allows you to continuously use a muscle. Muscular Strength is the ability that allows you to lift things. Body composition is how much fat and muscle you are made of. Flexibility is the ability that allows you to stretch past your toes and stuff. To start the unit Mr.Noon made a circuit of things to do that would help us with fitness (all the things above). Some of the things were weight lifting the others were jumping jacks, burpees, etc. The next thing we did was the cooper test, to test our Cardio Vascular Endurance. We went to a park which was 200 meters each lap and we ran for 12 minutes as fast as we could. Each person had a partner to record each of their laps. I ran 10.5 laps which means I went 2100 meters, my partner ran 10 laps which means he went 2000 meters. For a 12 year old I got a bad which is not very good. This is a 400 meter track. For our test purposes we used a 200 m track. 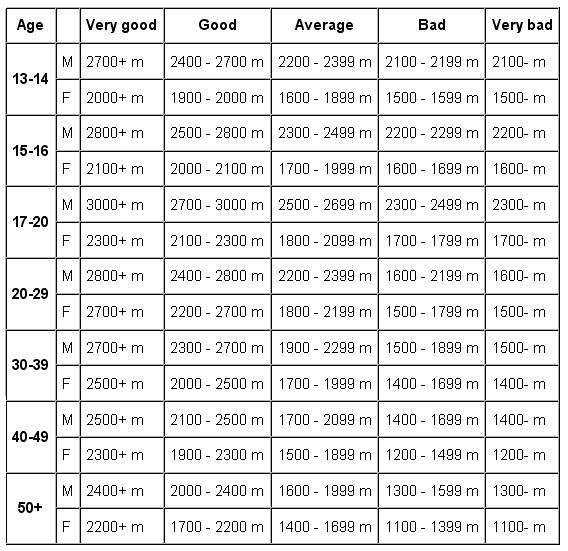 This is the chart and I am in the 13-14 year old section as you can see I got a bad because I ran 2100 meters. Later we did another test it was the same kind except this time we were measuring our fitness level for all the things like cardio vascular endurance, muscular strength, etc. Here are my scores for each one. For the sit-ups test I got 35 sit-ups in one minute, this one was for muscular endurance. For the push-ups test I got 29 push ups in one minute, this one was again for muscular endurance. BMI test for weight I got 52.4 for height I got 163.3 I got normal in the BMI calculator. very close to under weight. This was to test my body composition. Sit and reach test. I had to stretch to my toes and I got 14 centimeters. This was to test my flexibility. The last one was for muscular strength it was named Vertical jump test. I jumped 40 centimeters from the ground. In conclusion I have not only learned that fitness is good for you not only because it benefits your body, but also that you don’t turn off at work or at school. Also I have learned what I need to improve in some of the aspects of fitness. My goals for fitness in the next three months are to be able to jump 10 centimeters higher than my usual. The way I will do that is by going on my trampoline more often. I want to be able to run 2500 meters in under 15 minutes. The way I will do this is to run 1500 meters every day. I would also like to be able to touch my toes with my fingers. The way I will try to reach this goal is by stretching to my toes as far as I can for thirty seconds every day. I think we test our fitness because if we know what our level is we can improve and set a goal for ourselves. Sit and reach test. I had to stretch to my toes and I got 14 centimeters. The flexibility test was to test our flexibility. For the vertical jump test I jumped 40 centimeters. This test was to see our muscle power. Today in PE class we did a test named Cooper Test to test our cardio vascular endurance.We went to a park which was 200 meters each lap and we ran for 12 minutes as fast as we could. Each person had a partner to record each of their laps. I ran 10.5 laps which means I went 2100 meters, my partner ran 10 laps which means he went 2000 meters. For a 12 year old I got reasonable which is not very good.